The M2600 Shut-down unit engine controller is a back-up protection device designed for marine engines. It is ensuring safety shut-down of the engine in case normal primary shutdown fails. The M2600 Shut-down unit has been designed as a safety shut down device for protection of marine engines e.g. in generator, propulsion or pump applications. 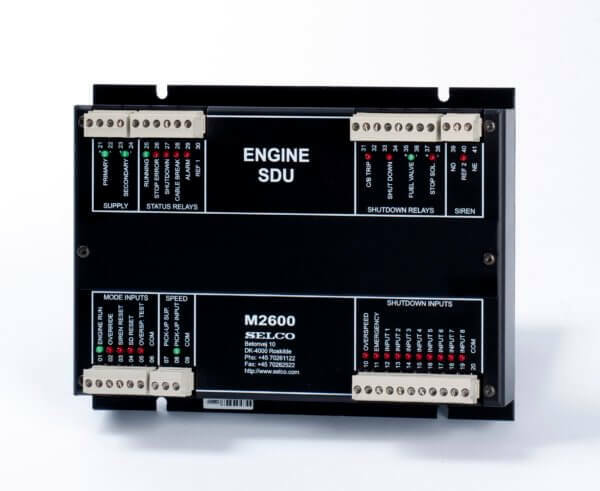 Together with the SELCO M2500 or M2000 or other Engine Controllers it can build up a complete Control, Alarm and Safety System for Marine Engines. However it can also be used as standalone safety device. In order to meet the restrictions of the classification societies with regards to safety functions, the unit has been designed entirely on discreet logic. There is no microprocessor or programmable electronic circuit involved. The module includes 10 shut down inputs for digital sensors. All sensor inputs are cable monitored. The speed can be detected either from a magnetic pick up or from a digital input. Shut Down outputs are available for stop and run solenoid. Both outputs are cable monitored. Additionally there are some status outputs for common alarms and shut downs.